Behold the open road. Long stretches of sun-soaked highway stretch out ahead as you roll down the windows and let the wind rake its warm fingers through your hair. 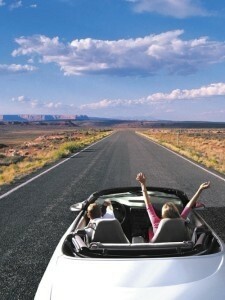 Turn on the tunes, throw on your shades and consider the fact that the future is as open as the sky above the horizon. However, road tripping with the family may not be as glamorous now as it was when you were a free agent. Fathers have plenty of vacation duties to attend to: Snacks must be packed, diapers must be changed and the music pumping through your speakers is more likely to be the soundtrack to the latest Disney movie than Sublime. Here are a few things to keep in mind when setting out cross-country with the wife and kids in tow. These tips can make hours spent in the confines of your minivan a little more bearable. 1. Just because your wife and daughter need to use the restroom every half-an-hour does not mean it’s fair to deny them water. If they have to pee, you have to stop. End of discussion. Don’t even think about suggesting a bottle. 2. Proceed with caution when it comes to initiating road games. While the license plate game seems like a great way to keep the kids occupied in New York, hearing their little voices yell “Michigan!” or “Nebraska!” every five minutes could seem like cruel and unusual punishment by the time you hit hour two. 3. Don’t slip sleeping pills into the kids’ applesauce. Though a few hours of blissful silence could be maddeningly appealing and, let’s face it, downright heavenly, when the kids awake they’ll be even more revved-up and you’ll be running on empty. 4. You’ll probably be anxious to hit the road, but if you forget to check the oil, put air in the tires and gas up the car, you could end up stranded on the side of the road with hot and cranky kids and, even more terrifying, one very, very angry wife. 5. Earplugs. They may not be street legal, but a pair of earplugs could end up being your saving grace. Slide them in, don your sunglasses and ignore the half of a peanut butter sandwich that just landed in your hair and think to yourself that someday, your kids will have children just like them.